The State Bank of Lizton: an institution that spans multiple locations throughout the Indiana countryside of Boone and Hendricks counties, and one that takes immense pride in their down-home style of customer interaction while staying abreast of industry-leading technological advances. Lizton paired with its neighbor Passageways to overhaul their employee intranet – and in the process, discovered a way to revive their communications with the very customers they keep at the heart of their business practices. 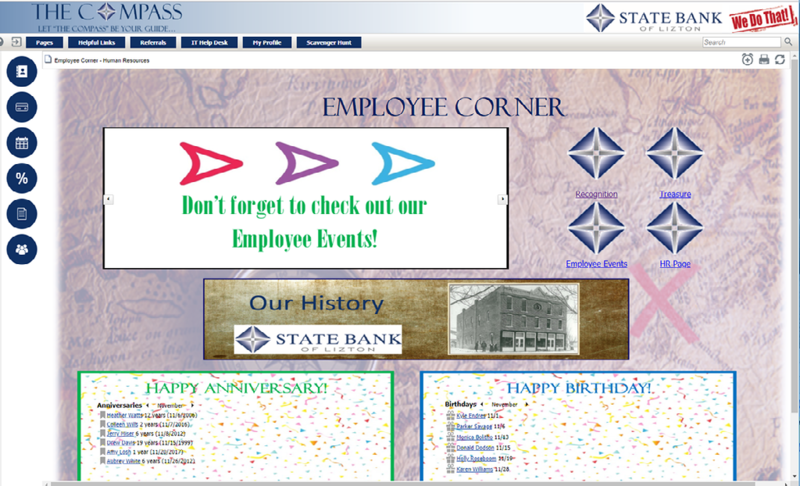 With a long history of public service and a strong sense of small-town loyalty, the initial foray into updating their employee intranet was grounded in a desire for customization and community building amongst its branches and their employees. Fondly referring to their employee portal as ‘The Compass,' this moniker encapsulates the goals of the company as they reached to create a more unified and easily navigable portal. Kyle Endres, the Training and Social Media Manager at the State Bank of Lizton, relates how he and his Lizton's department representatives use the various apps within the OnSemble employee intranet to create a portal that is distinctly their own. "We have designed our portal to look like a website so that it's our employees' go-to resource for all the information that they need – whether that be policies and procedures, instructions on performing a particular task, or HR benefits," he states. "We even use it for requesting different things within the branches – if something is going wrong, we make use of the Help Desks though our portal. From there, we just continued digging deeper into what OnSemble and Passageways could offer us." "Before we had an ineffectual method of recording our employee referrals – we were basically paper and pencil tracking. With the OnSemble Help Desk, we can track what our employees are submitting." Lizton was well on their way to unifying their distinct locales under the customizable umbrella of a centralized employee intranet – but an obstacle persisted in the very lobbies where they know customers by name. Each branch of the Lizton Bank network features flat screen televisions initially installed as a means of further connect and communicate with their customers – but lately, these screens have been blank. Kyle recalls the content that was displayed in time past, and why the company initially decided to move away from those displays. "We have the flat screens in all our locations, and had a service to populate content on them for several years," he recalls. "The content that was playing was financially related, in relation to the banking industry – the drawback was that we did not have any customized content on there. That was quite a costly service for us, and that was part of the reason for moving away from them – simply because we weren't even marketing our own bank through the product." 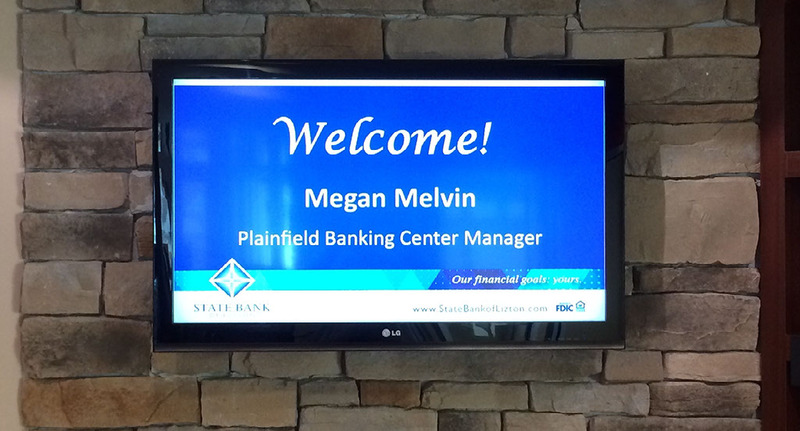 "[Our Lobby Screens] were still sitting idle when Passageways team came to an onsite visit, and a simple solution was identified at our initial meeting – we could customize our lobby screens with our employee intranet." With the decision made to move away from that provider, and with no solution identified at that time, the company had no choice but to allow the screens to go black. "We toyed with possible solutions, all while the TV's were sitting idle," Kyle continued. "They were still sitting idle when Passageways team came to an onsite visit, and a simple solution was identified at our initial meeting – we could customize our lobby screens with our employee intranet." With a broad field of vision and use, their OnSemble Employee Intranet proved to be a valuable solution that outclassed the competition – boasting the tools and assets the State Bank of Lizton desired to create a personalized marketing strategy that blended with their established employee portal. "Knowing that each location has its own screen in the lobby as well as on our employee portal, we can go in and make branch specific content very easily," Kyle says. "So right now our portal is running a series customized screens, promotions to our bank lobbies that tie in with the marketing we already do in the community. We also like to promote our managers at each of our banking centers - we have hopes to go the next step and highlight business of the month, and just continue to build on those slides." "Right now our portal is running a series customized screens, promotions to our bank lobbies that tie in with the marketing we already do in the community." The State Bank of Lizton has managed to revolutionize their business through communication amongst their employees and within their individual branches' communities – all with one platform, in one place. Underlining their creed that community is the heart of what they do, Kyle reflects on the importance of teamwork and how their bank feels empowered through their partnership with Passageways. "We're a small bank working with Passageways, and it feels like we have a say in the product when putting in different requests on possible enhancements we hope to see in the future – and then seeing those requests materialize and come out with updates, the support team is awesome. It's just a really good relationship to work with Passageways and have that support."